I have a friend who is dealing with some major health issues and wanted to send a note to let her know I'm thinking of her. This little chickie is in the upcoming Sale-A-Bration set called Honeycomb Happiness that is just too sweet for words, and I thought it, along with the one of the sentiments included, would be perfect. 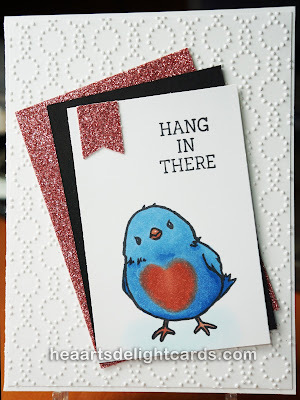 I stamped it with Memento ink, then colored a little "blue bird of happiness" with Copic makers. The greeting was slightly askew, so I decided to turn the whole image so it isn't noticeable. Lesson for the day: Stamp the greeting before you color the image, in case you mess up like I did. I could have stamped it on a label and fastened it over the first one, but I was going for the CAS (clean and simple) look with no bulk for easy mailing. See that luscious Glimmer Paper? That's Blushing Bride and will be available in the Occasions Catalog that starts January 5th! Is he not the cutest bird ever! I'm waiting for mine to arrive - oh the perks of being a demo :-).